LAHORE, PAKISTAN — In the Pakistani village of Sharbaga, about 130 kilometers from Lahore, a 70-year-old farmer named Mohammed Ali and his wife plant rice seedlings in a wide field. They stand ankle-deep in muddy water holding thin green leaves that they deftly press into the ground. It is hard work under a blazing sun, but this seemingly mundane task is a significant development that can help rural Pakistanis improve their lives. Mohammed Ali and his family planting rice in a once-barren field in the village of Sharbaga in northeastern Pakistan. Forty-three percent of Pakistan’s population of 170 million depends on agriculture for their livelihood, and two- thirds of the country’s citizens live in rural areas. Just a few years ago, this rice paddy and most of the surrounding fields in this village of 5,000 were barren. For decades the land has lain fallow because it is saline from poor groundwater. 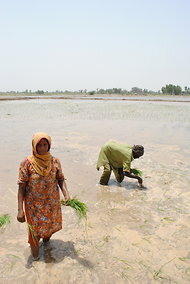 In 2006, the government of the state of Punjab, traditionally Pakistan’s breadbasket, and the United Nations Development Program started an agriculture project to rehabilitate saline farmland by treating it with gypsum. The Punjab government pays for two-thirds of the project’s six-year, $17 million budget, while the U.N. program pays for the rest. Nearly six million hectares, or about 15 million acres, across Pakistan, including 2.3 million hectares in Punjab, are barren because of salinity and water logging. Gypsum’s calcium composition can neutralize saline soil. Within a season of applying the white powder, farmers like Mr. Ali had transformed a long-degraded land into a field that yielded bountiful crops of rice and wheat. Forty-three percent of Pakistan’s population of 170 million depends on agriculture for their livelihood and two-thirds of the country’s citizens live in rural areas. Projects that help improve the lives of people on the ground are critical to creating stability in Pakistan, and yet these are often overlooked. Sustainable agricultural growth is a “necessary condition for rural growth, employment generation, poverty reduction and social stability,” said a 2009 report on Pakistan’s agricultural potential by Weidemann Associates, an economic development consulting firm near Washington. The report was prepared for the U.S. Agency for International Development in Pakistan. The biosaline project in Punjab has already helped lift 50,000 households out of poverty by raising incomes. From 2007 to 2010, the increase of rice and wheat production on rehabilitated land totaled 417,016 tons, worth $122 million. Dozens of enthusiastic farmers who gathered to meet a visitor to Sharbaga this past summer were unequivocal about how the agriculture project had improved their lives. Before the project, there were few ways to make money in the village aside from sporadic manual labor. Farmers owned small parcels of largely infertile land, and most of the men migrated to cities for work in factories or as temporary laborers. Now, all the men said their farming incomes had double or tripled, to as much as $230 a month, compared with the $90 or less that they could earn working in a factory, and migration to the cities is declining. Giving average Pakistanis the ability to raise their incomes and create financial and food security is important in a country where nearly 25 percent of the population lives below the poverty line. “It’s a great feeling of pleasure when we are able to earn as well as we do,” said Munawar Human, a 30-year-old farmer. In addition to farming income, the value of land in the village has shot up now that it is fertile. Land that was worthless a couple years ago is going for more than $6,000 an acre. Women in these rural communities are bound by tradition and cannot work outside the home. But through the program, thousands of women have been trained to cultivate gardens on their land and grow new kinds of vegetables in addition to staples. These crops feed their own families and the surplus can be sold to generate even more income. In the village of Liliani, about 100 kilometers, or 60 miles, from Lahore, 25 women learned to grow radish, turnip, squash and cauliflower along with garlic, onion, potatoes and peas in their gardens. Before treatment with gypsum in 2009, “the land was barren” and “we were desperate,” said Sher Banu, a 35-year-old mother of four. She estimated her garden generated nearly $60 during a harvest month. This is no insignificant amount in a country where average annual income is $2,500. With guidance from agricultural scientists and other experts from the Soil Salinity Research Institute and Soil Fertility Research Institute in Pakistan, some 70,000 soil and water samples have been collected in Punjab since 2007. More than 67,000 hectares have been rehabilitated with gypsum to yield promising results. After soil testing, agricultural scientists determine whether land can be desalinated with gypsum, and if so how much to use. Land is typically submerged in gypsum and water for 15 to 20 days. Pakistan has its own large sources of the mineral, though the project suffered a gypsum shortage last year because of rising costs. The project also helps build new tube wells to gain access to better quality water, and advises farmers on applying gypsum to water channels. After applying the mineral, rice and wheat can be grown in alternating seasons. There is even hope for land that cannot be desalinated, as agricultural scientists press for planting species that are saline-resistant. That explains the groves of eucalyptus and guava growing in Sharbaga. Farmers there had never heard of eucalyptus before. But the wood can be sold to make furniture, matchboxes and paper. Farmers were initially skeptical about the desalination plan when approached by project workers in 2006. Their land had been fallow for decades, and despite efforts to fertilize and water the soil nothing seemed to work. But project workers demonstrated the effects of gypsum on test plots. Once the farmers saw the results for themselves, they worked together to collect money to invest in their land. Reviving agriculture has been life-changing for many rural Pakistanis. Zeba Bibi, who also cultivates a garden in Liliani village, wants to know how she can make her mango trees healthier and more productive. She aspires to one day buy a tractor with extra income from crops grown on her family’s desalinated land. “We are looking forward to a better life,” she said.